For a few months now I’ve been making beer at home. It’s surprisingly simple. 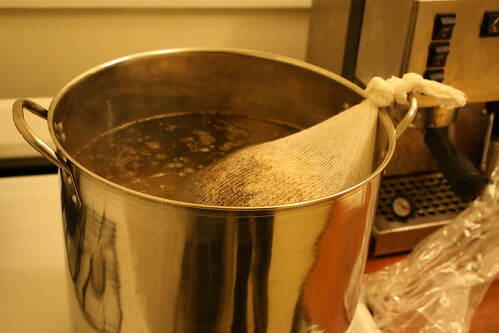 If you can make tea, you can probably make beer. 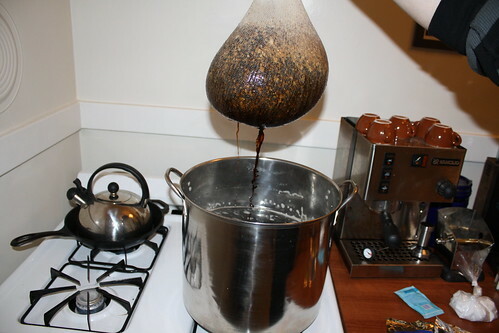 I’m by no means an expert at this, but I’m chronicling my attempt at making a porter. This is my 6th batch of beer ever, and it will take around two months. Not to worry though, there’s maybe 4 hours of actual work involved. The rest is just waiting. Important note: brewing beer at home is legal here in California, but it may not be where you live. Enough talk, let’s get started: here’s day 1 of making the porter. First you get a big pot of water to a near boil. 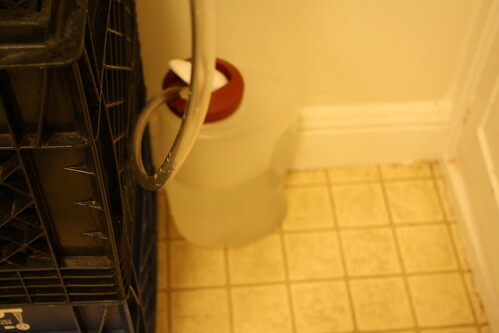 Three gallons of water (more or less.) 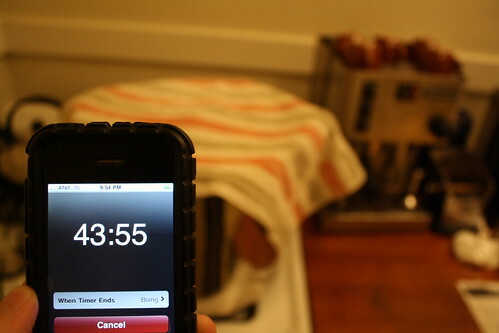 Unless your stove is super fast this will take a while. I think it took me about an hour. Once that’s ready, you have some free time. You turn the stove off, cover the pot, and wait 45 minutes. Then you spend a minute and 5 seconds fumbling with your camera trying to get the shot of you holding your iPhone timer to demonstrate this. It’s cool though, because you’ve got time to spare. Beep beep, 45 minutes is up and it’s time to pull the grains out! Now it’s back to a boil. The malt sugars and hops go in now. The malt I used here is thick and liquid, like maple syrup. Six pounds of malt sugar go in, so I hope you’re not on the Atkins diet. 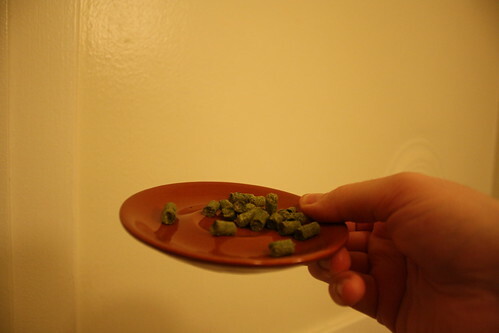 Hops come in little pellets and look like rabbit turds. They smell like, well, marijuana. Hops are what add flavor to the beer. They go throughout the boil at prescribed periods. This takes another hour. Okay, the hour is up, now it’s time to cool our batch down in ice water. 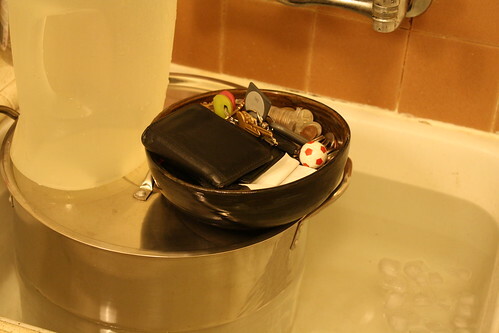 So we fill up the sink and place the pot in. But unfortunately the pot isn’t heavy enough and it floats, so we put a bunch of heavy junk on top to weigh it down. 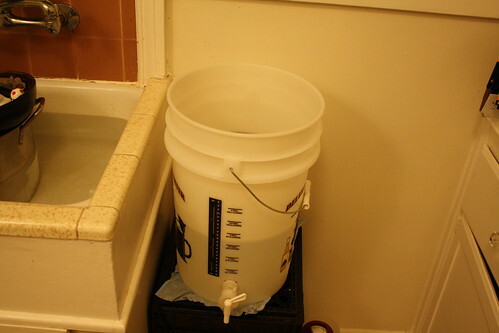 Meanwhile, we have a bucket of 2.5 gallons of room temperature water ready to go next to it in a sanitized bucket. The wort goes in here along with yeast, then it gets sealed. Here’s the whole thing sealed up and ready. 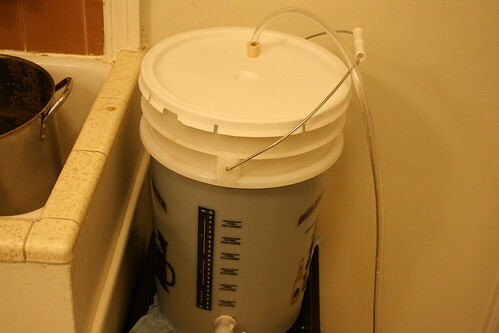 The hose acts as a one-way valve so the gasses from the fermentation can escape. 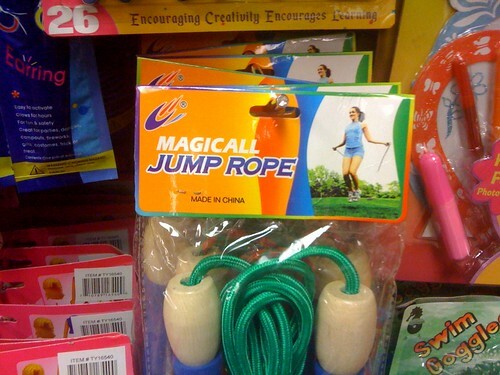 Where does the hose go? Into a bucket of water, of course! For you druggies out there, this is just like a hookah/water pipe. And that’s it! Next time: secondary fermentation. 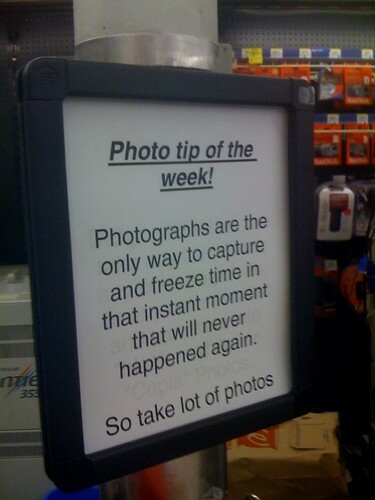 Here’s a photo tip from the Walgreens at 16th and Mission. It’s VERY helpful for all you aspiring photographers out there. 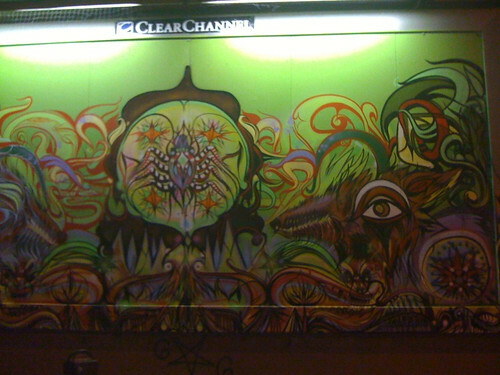 A street-level billboard on 14th St. and Valencia that recently featured a cool street art mural. 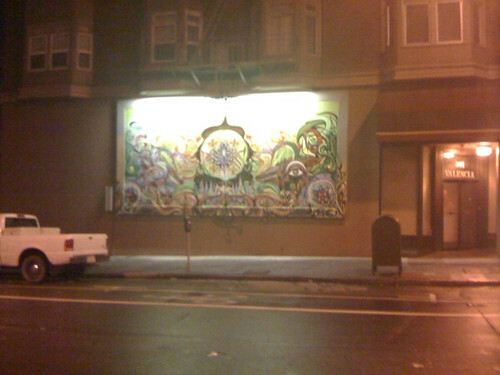 Unfortunately it was removed by “the man” before I could get a pic of it with my real camera. 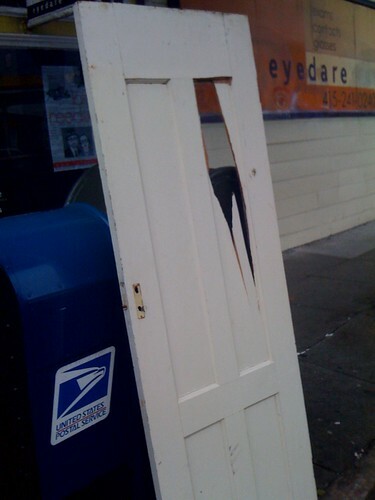 Someone pulled a Jack Nicholson on this poor door, then left it on a bunch of mailboxes at 16th and Guerrero. 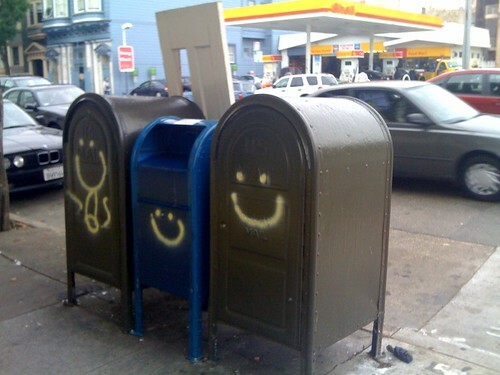 At least the mailboxes are happy about it. You are currently browsing the MrEricSir.com blog archives for February, 2010.